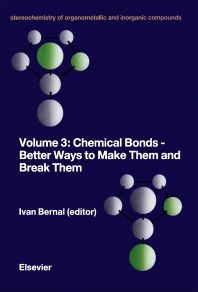 Stereochemistry of Organometallic and Inorganic Compounds, Volume 3: Chemical Bonds—Better Ways to Make Them and Break Them focuses on the processes, methodologies, reactions, and approaches involved in the making and breaking of bonds. The selection first tackles heterometallic clusters in catalysis and steric and electronic effects on the photochemical reactions of metal-metal bonded carbonyls. Discussions focus on heterodinuclear metal carbonyls, hybrid catalysts prepared from molecular mixed-metal clusters, and heterometallic clusters in homogeneous catalysis. The book then examines the stereochemical aspects of organometallic clusters, including reactivity, dynamics, and the structures and rationalization of bonding in alkyne-substituted clusters. The publication takes a look at the stereochemistry of the Sakurai reaction, as well as intermolecular and intramolecular reactions, optically active allylsilanes, and other reactions. The selection is a highly recommended source of data for chemists and readers interested in the making and breaking of chemical bonds.